Ordered items were exactly as expected - very fast processing and shipping. Designed for tactical applications that require minimal dust signature. A massive symmetrical blast baffle, redirect gas to the sides and upward delivering unparalleled recoil reduction while also minimizing muzzle rise and ground disturbance. High tolerance threads machined in same operation as bore aperture ensures perfect concentricity. Computer FEA optimized for maximum strength to weight ratio and impact survivability. Precision CNC machined from high strength steel bar for superior heat and corrosion resistance. Machined from top quality steel and finished in black oxide. I really like the Deltac Mini Mag muzzle brake I installed on my Mosin Nagant Build. The recoil is significantly reduced despite the rifle being lighter than the original configuration and it looks great. Noise is not much worse than stock. 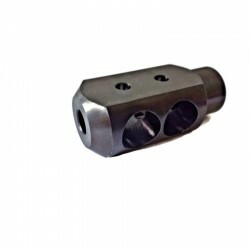 I ordered this muzzle brake along with the M15,1 RH thread alignment tool and a thread protector. All of it went together nicely with care and lots of cutting oil. Muzzle brake reduces recoil noticeably. Thread protector for when I remove the muzzle brake. Added Timney trigger with thumb safety and Boyd's tacticool stock plus RSI Scope mount. Turned out to be a great shooter. I recently purchased the Mini Mag for my Moisin Nagant M39 project. It arrived quickly and on examination it proved to be awell made product. My gunsmith installed ot for me and he didnt experience any problems. My rifle has a Archangel stock which is considerably lighter than the wooden stock. At the range i noticed a significant reduction in recoil over the original configuration with no noticable increase in noise. Compared to other muzzle brakes on the market I think this is an excellant value. Which muzzle brake should I get, a Bolt-on or a Screw-on?